In November Yellowknife is a nice fairy-tale winter town, the administrative centre of the North West Territories in Canada’s North, with around 20 000 inhabitants smaller than Rovaniemi. It hosted the first annual ReSDA workshop – a project worth knowing about in the Arctic! It is coordinated by sociology professor Chris Southcott of Lakehead University in Canada. ReSDA translates as “Resources and Sustainable Development in the Arctic”. 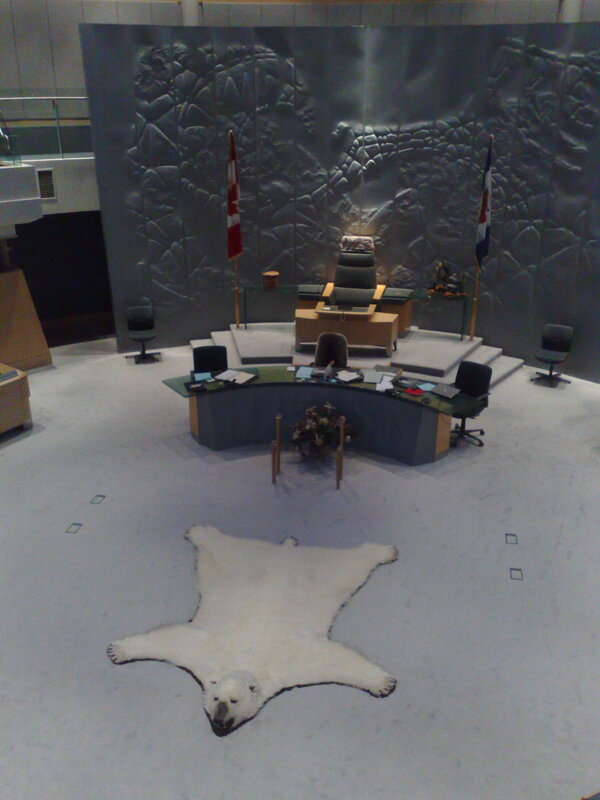 The parliament hall of NWT, Yellowknife. In case HM the Queen decides to join, she has a throne to sit always reserved for her. to reduce the negative impacts and costs of extractive resource development for Arctic residents, and increase the benefits for them. From the University of Lapland two partners participate: Florian Stammler with the anthropology research team at the Arctic Centre, and Lassi Heininen from international relations. The project is very special in many senses. One is that the leaders encourage a great degree of bottom-up openness and emphasize a lot of input by people on the ground. So on a circumpolar base, the idea is that Arctic residents tell us their own ideas about extracting resources on their homeland and reducing the costs as well as capitalising on the benefits. Remarkably, even in Canada the people on the ground did not mention a single time climate change as a research priority, as Chris Southcott mentioned, which is in line of what we found in Russia. The priorities are more towards increasing people’s wellbeing in the Arctic in many different spheres, and how the extractive industrial activity in the Arctic is a threat or an opportunity for this objective. Within these four spheres, researchers will focus on measuring impacts, analyzing impacts, and dealing with the impacts of the extractive industry in the Arctic. Given the source of the funding, quite a lot of the project will be focused on the Canadian Arctic. But there is a serious commitment to an integrated international perspective, and participants from Europe, besides us two from Lapland another six partners, are happy to be part of this. This entry was posted in All, Extractive Industries, Indigenous Peoples, North American North. Bookmark the permalink. I’m not sure exactly what the context of Chris’s comment on climate change research was – but I don’t believe it was related to the current project. Your post makes it seem like climate change might not be of concern to Northerners and that they may always prefer to rush headlong into extracting resources. I was definitely not going to give the impression that indigenous northerner’s don’t care about their changing environment and are just keen to extract resources. Thank you for raising this issue. The context in which this comment was made was in discussing research priorities with indigenous northerners, trying to find out what worries them most, what influences their lives, and how can social science partnerships (n.b, not natural sciences) contribute to improving their wellbeing. In this respect Chris’ comment reflects very much what I have seen in Russia as well (and published about, see http://arcticcentre.ulapland.fi/docs/ForbesStammler+2009.pdf), which is that there are many other worries in everyday life that people want to see addressed, without saying that climate change is not an issue at all. The problem is that the recent scientific and political discourses have been focused SO MUCH on climate change, that we sometimes think it is very hard to get ANY other research proposal funded which is not directly related to climate change. People also are worried about problems of employment, suicide, substance abuse, lack of vision and perspective in remote villages, gender imbalance, loss of language and religion, and many other things. And Chris Southcott’s comment seemed to me confirming this idea that we as researchers can contribute to presenting a more balanced idea of what the issues are that worry people in the Arctic. The “throne” is most usually for the speaker of the assembly… in the British parliamentary tradition…. It is difficult for me to imainge such a form of organization in the context of the current international system. (describe it as neo-liberal, predominantly pseudo-democratic, capitalist, etc.) 1. I have always been very sceptical about CSR, as it is most of the time merely a part of (watch out, big word ahead) corporate propaganda, as there is a need to appeal to the philanthropic side of consumers, while maintaining corporate non-philanthropic goals. So here I agree. Pointless. 2. Governments, especially such as one in the US, are necessarily in a tight relationship with business communities. There, as well, priorities are always directed toward increasing consumer spending, GDP, etc. Governments are uninvolved enough and interested at the same time to maintain the lack of priority shifting towards a more environmental, philanthropic approach to policy-making, rather than the growth approach that is primarily concerned with industry specific growth indicators in relation to other countries. And it really is true for both domestic, as well as international so-called social-oriented’ government initiatives. They are all defined within the concept of recipients as consumers/taxpayers and not simply equal human beings. Agreed once again. Governments are not doing rat. 3. Hence, I would have to assume EXTREMELY difficult the emergence of a form of organization that could specifically tackle the source of the problems of the environment, poverty and hunger, social inequalities in all their forms, etc., as once again the source of the creation of those problems in the present and/or the persistence/development of those problems socially adhered from the past is rooted in the praised free market, as it assumes abundance and not sustainability, efficiency for the production process, but not for the environment, unsupervised income distribution that concerns only the brightest of the world’. If we were to suggest philanthropy in the purest sense of the word, we would have to think of a way to change the fundamental values of people from individualistic to caring, from material gain to love, and to think critically about everything they come to know. Whether or not it would be done through some sort of constructivist communication, I don’t know yet.Personally, I do not see it possible in the current system, and I also think there has not been a system that would do precisely that yet. In most cases, people would label someone with ideas like these a utopian, a communist, etc., but once again, I have not come across/up with a system that would deal with these issues and politics / existing power relations at once. We’ll see. Ultimately, the least business could do is put environment/humans first if they want to remain in the world of not-so-peaceful capitalism.Great post! Thank you!